And next on our tour, an illegal stop in NYC. Coming to a block near you! French-government owned bus and tour company making illegal pickups and drop offs all over NYC! Presenting Open Loop NYC, a company owned and operated by the French government that does what they want without the De Blasio administration even thinking of issuing a violation! Imagine waiting to cross the street in Manhattan, you’re on the corner about to cross and out of nowhere a giant double-decker bus cuts in front of you to let out 30+ passengers. They don’t care about you. You’re pushed to the side – you have nowhere to go. In NYC, Open Loop NYC, a hop on hop off tour bus company is creating their own personalized routes and you better get out of their way. This violation of law shows incredible disdain towards NYC and our rules and regulations. Open Loop blatantly violates procedures and laws without a single action from the responsible agencies that are supposed to enforce rules and regulations here in the city of New York! This is a major problem and companies like Open Loop NYC are directly responsible for illegal drop offs and pickups, even going so far as to advertise them online! Their Web site is an open door to their abuse of this permit. See for yourself. Map from Open Loop NYC pamphlets showing illegal stops. Open Loop NYC has a DCA license, which allows them to operate. The company applied for a bus stop from the DOT back in April 2014, which was approved. The stop is located on the southeast corner of Bowery and East Houston Street, according to a DOT spokesperson. No other stops are permitted and police are responsible for enforcement, not the DOT. Hey cops wake up! 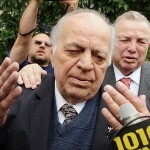 What is the NYPD doing about it? The NYPD refuses to summon and violate many of these tour busses. The result? Smaller companies are forced out of business because they follow the rules while Open Loop continues to grow. What type of message are they sending to tax paying citizens for being responsible and following rules and guidelines? 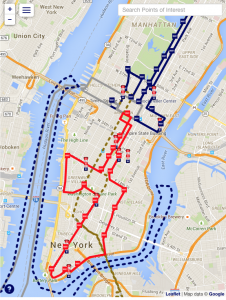 A map directly from the Open Loop NYC website showing their illegal stops. 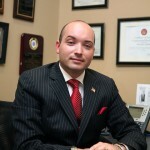 What are elected officials doing about it? 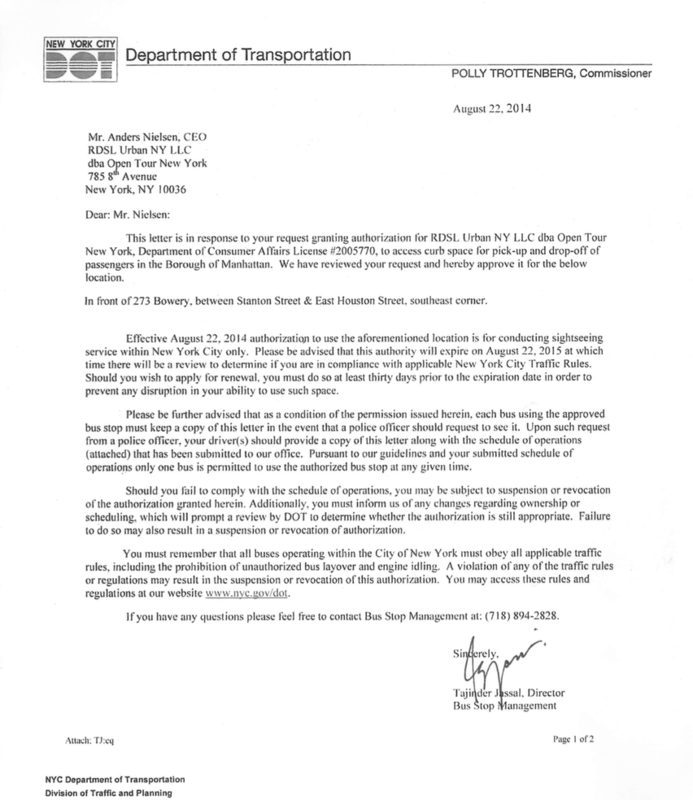 Council Member Dan Garodnick received confirmation from DOT late last week that Open Loop is only authorized “to make stops for pickups and drop offs at Houston and Bowery.” His office is currently informing precincts of the obvious illegal activity. Garodnick is correct. Open Loop has only one stop allocated by the DOT (but with more than 40 listed on their website). As of this date, Open Loop is illegally using other company’s stops causing congestion. Law-abiding companies are then put at a disadvantage while Open Loop operates with impunity. These are the regulations that everyone has to abide bye. Hey, Mr. Mayor, why aren’t you enforcing this? The process. We’ve all seen the enormous double-decker hop on hop off tour busses making their rounds throughout NYC. Most of them are well-regulated and make stops at locations approved by the DOT (The DOT has an approval process by which companies submit stop locations for approval and the city determines whether or not to grant such authority). To keep traffic moving and to avoid overcrowding and cut costly time delays, the DOT does not grant access to more than one company for any single stop. However, companies like Open Loop NYC, skirt this law with little to no enforcement. And the company knows this. That’s why you can’t cross the street in peace. Queens people beware. So who exactly owns Open Loop NYC? Open Loop NYC is owned by The RATP Group (Régie Autonome des Transports Parisiens), which in English translates to Autonomous Operator of Parisian Transports. In other words, the French government owns Open Loop NYC, and they apparently have no regard for the law — let alone New Yorkers who are just trying to use the streets and get to work on time. 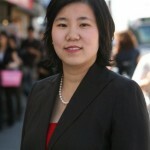 Open Loop NYC was contacted for commentary but did not return the call before publication. Why skirt the law? In order to enter the NYC market, all companies can either buy an existing operator with stops or apply directly to the DOT and wait for them to be granted, which can be time-consuming. Open Loop chose to do neither. Just look at their website. 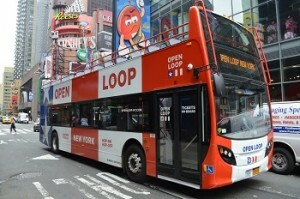 If you look at the map on this link (https://www.openloop-ny.com/new-york-uptown-bus-tour) you can click on any of their “bus stops” to find out where they are. They list about 40 bus stops on the website yet only one of them is approved by the DOT. Open Loop NYC has no authority to stop and load/unload passengers yet they have been operating without any enforcement. This “create your own stop” mantra is a major safety concern and creates exposure for the city if an accident occurs due to multiple companies jockeying for the same space. What is to stop anyone from entering the market if everyone can stop wherever they want? And what is to stop other companies from stopping at each other’s stops, poaching their passengers and getting into turf wars? This is a real problem! 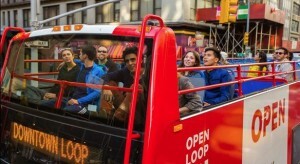 Next time you see an open loop tour bus drive realize that it’s the French government operating a business without any concern for NYC’s rules and regulations. Vive la France.